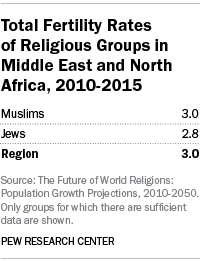 More than nine-in-ten people in the Middle East and North Africa were Muslim as of 2010 (93%), and the share of the region’s population that is Muslim is expected to be slightly higher in 2050 (94%). 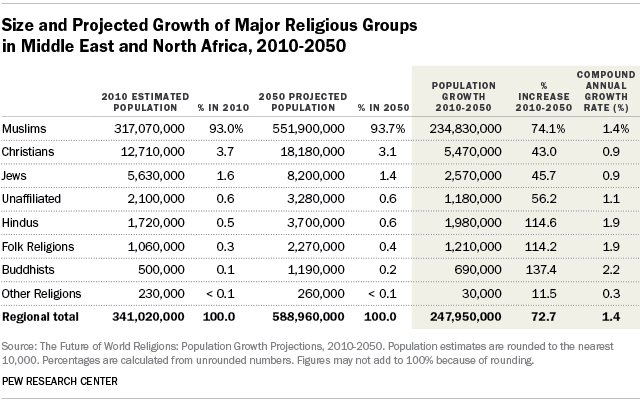 The Middle East-North Africa region’s Muslim population is expected to grow by 74% from 2010 to 2050, from 317 million to 552 million.62 Christians and Jews are projected to remain the second- and third-largest religious groups in the region, respectively, with more modest population gains of 43% and 46%. The smaller, religiously unaffiliated population is forecast to grow 56%, from about 2 million to more than 3 million. Hindus, adherents of folk religions and Buddhists are expected to experience the greatest growth as a percentage of their modest 2010 counts, with each group more than doubling in size by 2050. Only about a fifth of the world’s Muslims live in the Middle East and North Africa, but it is the only region where a majority of the population is Muslim.63 While the Muslim share of the region’s population increases slightly in the coming decades, the Christian and Jewish shares are expected to decline modestly. The Total Fertility Rate of Muslims in the Middle East-North Africa region is 3.0 children per woman in the 2010 to 2015 period, considerably higher than replacement-level fertility (2.1). The fertility rate of Jews is 2.8. Data on the fertility of Christians is not consistently reliable across the region. However, the available evidence suggests that Christian fertility in the region tends to be lower than Muslim fertility. In Egypt, for example, the fertility rate for Christians is 1.9, compared with 2.7 for Muslims. 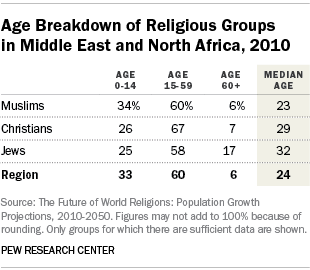 As of 2010, the median ages of Christians (29) and Jews (32) were older than the median age of Muslims (23) in the Middle East-North Africa region. The higher median age of Christians partly explains why Christians are forecast to make up a declining share of the region’s population in future decades. Because of a lack of data, religious switching was not modeled for Israel. 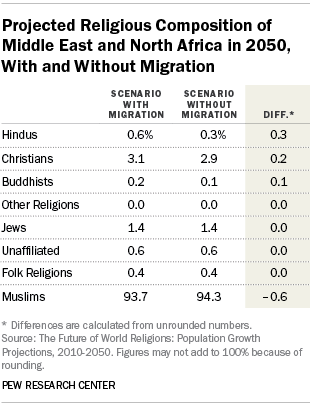 In a projection scenario with no migration, the expected shares of Hindus and Buddhists in the region would be half as large as they are in the 2050 forecast that incorporates expected migration flows from Asia. While the shares of the region’s population that are Hindu or Buddhist are expected to increase due to migration, these religious groups still are expected to make up less than 1% of the region’s total population in 2050. While emigration out of the Middle East and North Africa is projected to lower the share of Christians in countries such as Egypt, Iraq and Syria, the immigration of Christians into the GCC countries is expected to more than offset these departures for the region overall. Thus, migration is expected to slow the projected decline in the Christian share of the population in the Middle East-North Africa region. If migration were not factored into the 2050 projections, the estimated Christian share of the region’s population would drop below 3%. With migration factored in, however, the estimated Christian share is just above 3% (compared with nearly 4% as of 2010).